Skylights featured four times on Earth Science Picture of the Day: 1 , 2 , 3 , 4 . Photo of the Week.. Jupiter lies just southeast of the Beehive Cluster in Cancer and almost within the four-star box that makes Cancer's "Manger" in this photo taken on March 6, 2003. Castor and Pollux in Gemini lie off to the right. Compare with the "Stars" picture taken 12 years ago, the pair showing Jupiter having made a full orbit around the Sun. Astronomy news for the week starting Friday, March 14, 2003. Skylights is presented a day early this week. We begin the week with the Moon in its waxing gibbous phase heading toward full, the phase reached the morning of Tuesday, March 18, about the time of moonset in North America, which will correspond almost exactly with the moment of sunrise. The night of Monday the 17th the Moon will be just short of full, and will rise just before sunset. About one day past full, the Moon will pass its perigee point, where it is closest to the Earth, a distance of 363,300 kilometers (225,700 miles), 5.5% closer than average. The big event for the week is the passage of the Sun across the vernal equinox in Pisces on Thursday, March 20, marking the beginning of spring in the northern hemisphere, fall in the southern. At 7:00 PM CST, around the time of sunset (depending on longitude), the Sun crosses the celestial equator heading north. It will then shine directly overhead at the Earth's equator, rise at the North Pole, and set at the South Pole. Everywhere on Earth but at the poles, the Sun will rise due east, set due west, be up for 12 hours and down for 12: hence the term "equinox." (Technically only: in reality, the half-degree diameter of the Sun and refraction in the Earth's atmosphere will cause the Sun to be up for a few minutes more than 12 hours, to rise at the North Pole a couple days in advance of equinox passage, and to linger a bit at the South Pole before it finally gives it up.) Since the Moon passes its full phase just three days before, it will be just shy of the autumnal equinox in Virgo, causing it to rise close to exactly east, set west, and be up for 12 hours, creating a lovely, though accidental, symmetry between Moon and Sun. In the evening, Saturn and Jupiter slip slowly westerly when viewed at the same time of night, the ringed planet now setting around 1 AM, Jupiter lingering in the western sky until just before dawn. At the same time, Saturn is moving easterly against the background stars of western Taurus (just northwest of Zeta Tauri), while Jupiter still moves retrograde (westerly) in central Cancer. As Jupiter sets, Venus rises, this brightest of all planets now notably lower in the brightening southeastern sky. Mars, now in Sagittarius and near the most southerly point of its celestial journey, is well to the west of Venus, rising around 2:30 AM. 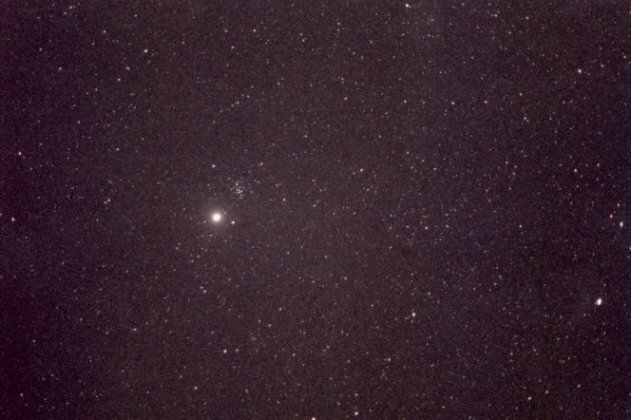 Jupiter is now just to the southeast of the Beehive Cluster in Cancer, allowing easy identification of both the cluster and of this dim zodiacal figure as well (The Beehive is a very pretty sight in binoculars, which will also enable you to see Jupiter's four large Moons, Io, Europa, Ganymede, and Callisto). Note the box of four stars that surround the cluster, which make an asterism called "the Manger." To the west shine the bright stars of Gemini, to the east the lordly figure of Leo, the Lion.